What’s best about the interactive installations of Moscow-born artist Alexandra Dementieva is how psychologically compelling they are. Technically proficient, visually striking, fundamentally simple despite the mechanical and computational pyrotechnics she and her associates put themselves through to produce them, her works draw spectators into them, and in ways that circle back into their own minds. Her goal, she says, is to “make people feel like I feel”. She probably does do that, although it isn’t possible to really know what the artist feels; it’s only possible to know what we feel, which is that we’ve entered a world where our notions of reality are challenged, our expectations suspended, our perceptions redirected. Bicycles don’t travel: people travel inside them; forests don’t encircle us or lead us along their paths: they mirror us in warped time and reveal our fellows in a time frame even more warped; moviolas don’t just play movies: they make us believe we’re projecting our inner thoughts. Some of my favorite Dementievas are these: In Mirror’s Memory (2004-6), a screen bisecting a gallery reflects the viewers, but as they step on an interactive carpet, their image is recorded and replayed as if they are surrounded by previous visitors and as though they are amidst a quarrel. 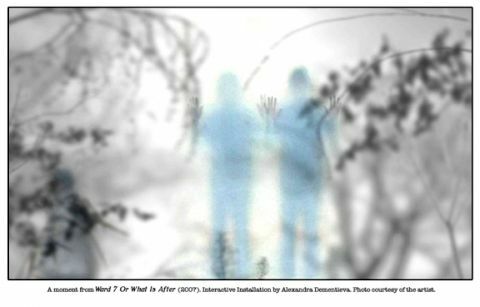 In Ward 7–Or What Is After (2007), a play on Checkhov’s Ward 6, visitors encounter a hazy, blank screen, but soon forest sounds and images emerge, and as the visitors approach the screen they appear on it as if inside the forest, encountering other visitors who were there before. In Stalker (2007), this title taken from Tarkovsky’s film, hundreds of clips from decades of film history play randomly, set off by a spectator’s squirming in a seat, but believed by that specator to have been programmed by their psychological state because the artist has fooled them into thinking so. Dementieva speaks about “inside and outside”, which she defines in every way possible. Besides the social ideas of insider and outsider, and the psychological ideas of inner thoughts and outward behavior, most of her pieces are built as actual physical enclosures which hide a live participant inside, sometimes a professional dancer or athlete, sometimes a viewer-participant: spectator-participants are outside, but then they may come in. Wit and deft humor are parts of her game. She also says that when she creates a piece she is inside, but when it’s complete it exists outside herself but the spectator is inside. When no one is inside, she says her work ceases to exist at all! Coming upon such intense, shared, personal vision in an age when contemporary practitioners so relentlessly respond to worn-out ideas and phenomena, and tiresomely churn out arid sociological illustrations and propaganda in a way that can only be termed “retro-garde”, our thirst for quality is at last slaked: Alexandra Dementieva reopens the possibility that in this new century High Art might finally gain ground.